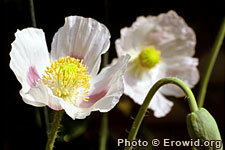 Papaver somniferum is a annual that with brilliant white or red flowers growing on a central bulbous pod. When scratched, the pod produces a milkly latex called opium. This latex contains a variety of opiates including codeine and morphine. It has a long history of use in Asia and Europe.